I told my five year old nieces that they were really lucky as they were getting to read this book before other boys and girls could read it and that the author wanted to know what they thought of it. It got a resounding ‘fantastic’ from both of them! They were so excited first of all to unwrap the lovely parcel sending ‘snow’ everywhere. I have to say I didn’t get any of the lovely chocolates which Natalie Page (author) and Chris Rivers Nuttall (illustrator) kindly included! The book follows friends Zak and Jen as they use their umbrellas to fly off through space (“like Mary Poppins!” said one of my nieces excitedly) to visit a mysterious town with huge though empty houses, Christmas trees, twinkly lights and lots of snow. As they explore the empty town, the clock strikes midnight and that’s when the magic starts to happen. My nieces aren’t quite able to read the book themselves yet so we read it together and they had great fun trying to work out the rhymes in the story. I did have to stifle a laugh when one of them, trying to work out the rhyme for ‘dine with me’ said orange juice instead of hot tea. Well, I had asked her what she liked to drink! They loved looking at the beautiful illustrations and spotting all the Christmassy things in the pictures and were very excited when Santa and his reindeer put in an appearance. I’m not sure their dad will thank me for that so far away from Christmas! From an adult’s perspective, I thought this was a wonderful book for children. The illustrations were beautifully done with a combination of the cartoon-like Zak and Jen set against the beautiful snowy landscape, starry skies and northern lights. The pictures were very eye-catching and matched perfectly with the story. The rhyming structure makes it a pleasure to read aloud as well as fun for the children to try to join in. It has all the elements needed for a perfect Christmas story with a bit of mystery and wonder as Zak and Jen explore Tinsel Town. Tinsel Town is a book which will delight young children as it’s full of magic and excitement. It’s a very enjoyable story, with gorgeous illustrations, as you can see from the ones included in this blogpost, and sure to be enjoyed as much by the adults reading to children, as the children themselves. Thanks to the author for offering me a copy of her book. 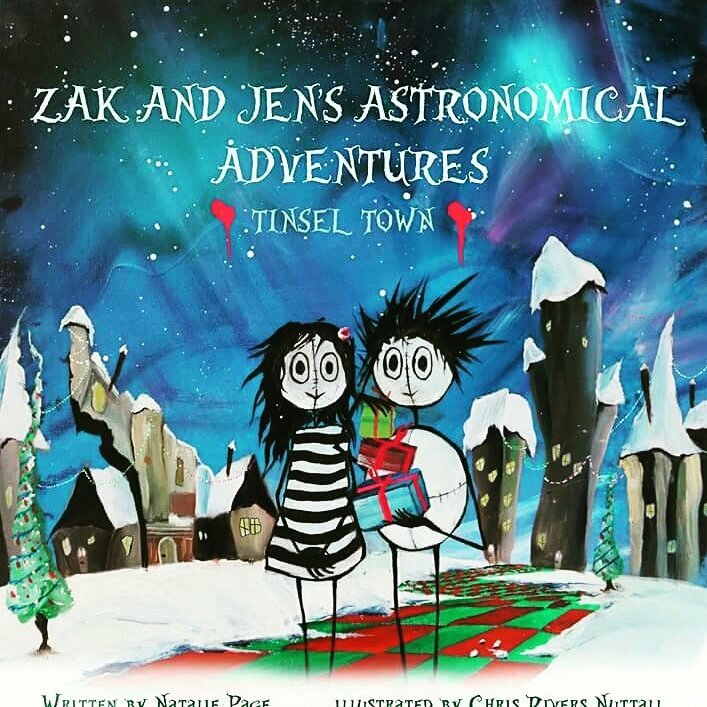 Zak and Jen’s Astronomical Adventures: Tinsel Town is available to pre-order through Natalie and Chris’s Etsy store (https://www.etsy.com/uk/shop/ZakandJen). Their first book, Zak and Jen’s Astronomical Adventures: The Petal Planet, was published by Austin Macauley Publishers and is available to buy on Amazon.co.uk and Amazon.com. Now read on to find out about Natalie’s favourite Christmas films. As an author, people expect you to love books, and I do. However, I must let you into another secret, I adore films. I don’t really have a favourite genre, I am happy to try anything at least once, but the films I love are the ones that invoke emotion or memories. Today, I am delighted to be able to share with you some of my favourite Christmas films and why I love them. You will note that I haven’t ranked these, and that is because I love them all equally, but for completely different reasons! Let’s begin with a timeless classic. The Snowman is the first real Christmas cartoon I can remember seeing when I was a child. I loved the music and the concept of the snowman coming to life, it was completely magical and I was hooked from then on. As I grew older, I became more inclined to like films where there was more script so I lost interest in the Snowman, but it will always hold a special place in my heart, as I am sure it does in millions of others. I will be introducing my daughter to this properly this year. If I had to pick just one Christmas film, this would be it. This film holds some incredible memories for me. My parents and grandparents were huge fans of the old classic movies (and movie stars) so my sister and I were well educated in the adventures of Frank Sinatra, Danny Kaye, Bing Crosby and Fred Astaire – to name a few! This film stars Bing Crosby and Danny Kaye and is one of my mum’s favourites. When I was growing up our family had a tradition, whenever it was cold and wet outside, we would snuggle up on the sofa with hot drinks to watch old films. My sister and I loved the singing, dancing and the dresses the female leads got to wear and the scripts were pretty funny too! To this day I still watch White Christmas every Christmas. My daughter even seems to be a fan of Bing Crosby too! I would say, regardless of what age you are (I am 35 by the way) you should see this movie at least once. They simply don’t make them like this any-more, it’s definitely one to watch with parents and grandparents. Ah, I love this movie! As a child growing up in the 80’s and 90’s it honestly felt like this was on every Christmas (along with the original Home Alone). It always seemed to be scheduled on Christmas Eve, so our family would go to Church and then come home so that my sister and I could watch it while my parents would make last minute preparations for Christmas (this usually involved searching for presents brought months earlier for wrapping). Dudley Moore is an elf at the North Pole but flees and finds himself in NYC. He takes a job at a failing toy company and unwittingly becomes part of the CEO’s plot to take over Christmas. I wouldn’t necessarily say this is a great movie in itself, but it carries such nostalgia for me, I can’t help but like it! This is another timeless classic. The tale of one man who gets to see what the world would be like if he was never born. This is another film that fills me with memories of my grandparents and I will admit, I do get quite emotional watching it. The film stars James Stewart who tries his hardest to do his best for everyone but regularly finds himself losing out to much more unscrupulous characters. Eventually he hits rock bottom and is about to do something stupid when an angel in training is sent to save him and show him exactly how he has impacted the world and the people around him. Sometimes I think it would be good if everyone was able to see the effects that they have on others. I truly think the measure of us is how much good we do and how many lives we improve rather than how much money we make. This Christmas, I will be making sure to take time to appreciate family, friends and others and to make sure they know how important they are to me. These are my girlie Christmas films, the ones I have watched with many female friends over the years and commented on whether we would choose Jack Black or Jude Law – when ultimately what you really want is a combination of the two. Or whether in fact you would really want some guy to show up outside your door with nothing but a boom box and a stack of hand written cards saying how perfect you are. The reason I love these films is not for the romantic story lines, it’s for the comedy and the interplay between all the characters. For me, they are simply great feel good movies!